Dolphin Statues - Click on an item for more details! 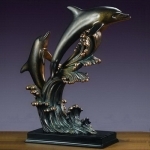 This stunning Trio Dolphins on Waves Figurine is individually hand crafted from the finest quality materials. A beautiful addition to any home or office. 8.5 inches H. x 8 inches W. poly resins on a high quality wooden base.